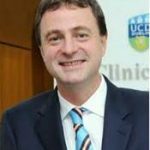 Des Winter MD is a consultant general, gastrointestinal and colorectal surgeon at St. Vincent’s University Hospital (SVUH), Dublin, Ireland and Clinical Professor of Surgery, University College Dublin School of Medicine & Medical Sciences, Dublin, Ireland. He currently leads the Familial Colorectal Cancer Research Group at the Centre for Colorectal Disease, SVUH. Here he has established a clinic for overseeing risk-evaluation and surveillance of intestinal and gastric hereditary tumours, the FORESIGHT Clinic. This is the first clinic in Ireland to mainstream cancer genetics for non-breast, solid organ cancers.